from 3 pcs. 75,14 EUR ea. from 10 pcs. 68,73 EUR ea. from 20 pcs. 65,62 EUR ea. from 40 pcs. 62,87 EUR ea. 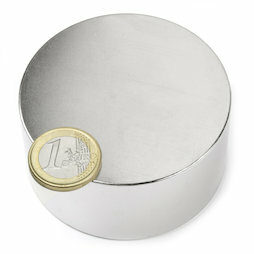 A power magnet full of extremes: The largest and strongest disc magnet we ever had in our assortment - and with a weight of 1 kg also the heaviest. Blessed with an unbelievable adhesive force of 140 kg, it is an exciting but also dangerous magnet that can cause serious contusions. Please handle with the utmost care and review our safety tips! 1 pc. 23,35 EUR ea. When handling this magnet, you need to wear thick protective gloves. This power magnet has no trouble holding 8 cm long screws and a screw wrench through a thick book. In this custom-made cardboard box with styrofoam base the magnet will reach you safe and sound.